This is a cross-post of a guest blog I wrote for FITC.ca recently. 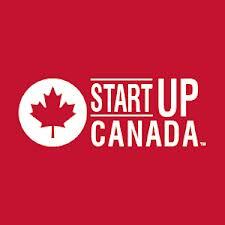 Earlier today, I was one of three guests answering questions about business plans for startups on a Startup Canada’s weekly #startupchats Twitter session. It turned out to be a lively debate that let us all explore our assumptions and get past the platitudes to more meaningful discussion than this type of event sometimes delivers. Stratpad is a cloud-based business planning tool. Anyone familiar with my business approach will be unsurprised by the fact that my positions on each boil down to the fact that apparently conflicting approaches are more often complementary. Hope to hear your feedback. What did we get right? What do you disagree with? I meant to start writing this post earlier today when I found myself browsing Facebook instead. It happens… But my Facebook feed pointed me right back to the topic by presenting me with a funny image that made me think of Satish Kanwar’s talk at AndroidTO. The caption read, “Best Buy: Try it out before buying it on Amazon.” Funny but true, though “Amazon: Read about it before buying it at Best Buy” would be just as true. There’s a reason Kanwar didn’t use the terms “e-commerce” or “online shopping” in his title. One of his core points was that it’s all just commerce and shopping. If you research the product in store then purchase online, is that online shopping? If you research it online then buy in store, is that bricks and mortar or just self-service 1-hour delivery? Kanwar made the case for moving past the ideas of online and offline commerce to just “commerce”. He showed how online transactions are just a fraction of the pie, and how online shopping influences offline purchasing. Buyers don’t align their behaviour to the constructs of “online” vs. “offline”, they mix and match their shopping related activities according to their preferences. And millennials, he pointed out, expect a seamless experience across mediums. Gone are the days when it was accepted that the online and bricks & mortar versions of a store would be very different. An interesting study he referenced said that if a retailer’s store is closed when customers want to shop there, 36% will buy it online from that retailer’s website and 22% will shop online for the best price. That 22% represents a great opportunity for small businesses. The opportunity for small retail businesses was another theme of Kanwar’s talk. Opening large or numerous retail stores is a very costly proposition, and in the past, online buying was generally considered risky. So small businesses had a limited market to work with. Now that online shopping is more prevalent, small businesses – especially those with a solid mobile experience – can expand their market without a huge investment. To demonstrate, he talked about an experiment he conducted, quickly creating and promoting (Twitter, Facebook) an online sock business. With the store up and running (via Shopify, of course) they sold $500 of socks in 24 hours. That experiment provides another lesson, too. There are lots of online and offline stores selling socks already but there was still clearly room for another. If your value proposition is unique or the market is big enough, there is opportunity. He might be right, but I’m not quite convinced department stores will die. There’s a lot to be said for knowing the item you want is likely in stock and you can see and touch it before ordering. Innovative online retailers like Frank & Oak with home try-on and return options for clothing are definitely taking a bite out of traditional retailers but I have a feeling there will always be a place for shopping in store. Only time will tell. Enabled by technology, small businesses can differentiate on any of these. Lots of food for thought for anyone considering a retail business. So where does Android fit into all of this? Android, Kanwar pointed out, is the fastest growing mobile platform so businesses wanting to take advantage of this new world of commerce need to make sure they have a solid Android experience. And yes, he assured us, Shopify is on top of that. FITC has posted my latest guest blog on their site, a recap of a talk where Adam RT Smith points out the pitfalls of the Minimum Viable Product methodology. 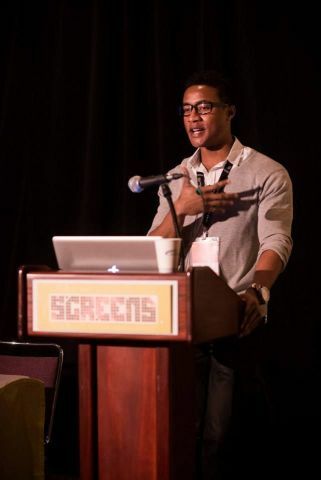 I recently guest blogged again for FITC, this time at their Screens 2013 mobile and tablet development conference. Anthony Ilukwe gave an interesting talk to the developer attendees on how to decide which apps to devote time to and which ones to set aside. Check it out on FITC’s blog. 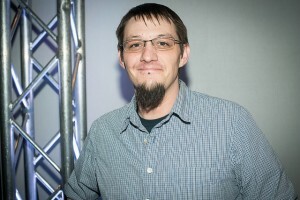 We waited for the punchline that would indicate he was being ironic but no, that really was the premise of his talk. This was an old-school media relations guy who came to pitch a bunch of content marketers on why he thinks what we do has no value and we should focus solely on getting positive reviews of our products in “reputable” publications instead. But I’m glad I stayed, because the end of his talk was priceless. He explained that “content marketing is just companies posting things saying how great our products are”, tipping us off that he wasn’t really opposed to content marketing, he just didn’t understand what CM is. A few in the audience tried to explain that CM is more about delivering relevant content that your customers will value than directly promoting your product, but PR Guy would have none of it. He kept going despite the obvious chill in the room, until he stated flatly that CM has no impact on customer behaviour, only “reputable publications” with “unbiased journalists” do because that’s all customers trust. I couldn’t keep quiet any longer. My time at SqueezeCMM had showed me how wrong he is. The group held their collective breath waiting to see how this played out. PR Guy sputtered a few more comments, each one countered by someone in the room then finally read the room and saw that he was alone. “I was really just trying to be controversial,” he offered. “Mission Accomplished!” I replied with a smile and a thumbs up, which got a relieved laugh from the room. With the tension diffused, PR Guy launched back into his talk with a less hostile audience – but not an engaged one. From that point on there were more people answering email on their phones than even pretending to pay attention. PR Guy shifted his focus to why traditional media relations are still necessary but it was too late. He’d lost the audience. The useful content in the rest of his talk was ignored by most because he’d forgotten PR 101 – know your audience. So little attention was being paid that most missed his unintentionally ironic finish. It was all I could do not to giggle out loud. When he left, my peers said it was obvious from the twinkle in my eye that I found something funny but they didn’t know what, so I told them. “Did you catch his suggestion that we sign up for his newsletter?”, I asked? Now they got it. Mr. Content Marketing is BS really had closed his talk by promoting his company’s content! PR 201 – If you’re going to take a stance against something, it’s probably good to know what it is. This is a very insight filled piece, written by a 13 yr old girl. Even she is exceptional, in that she attended a tech workshop and cares enough to write a piece like this, but isn’t interested in a hands-on tech career and she confirms many of the factors we’ve suspected keep girls from going into tech. I think there’s a lot we can do with her insights to change both the optics and the realities that keep girls like Lottie from pursuing tech. One of my clients is moving out of beta today and boy, have I learned a lot working with them. Like most people, since Twitter became so important for business communications, I was shortening links to get the most from my 140 characters. But until I started working with the team at @SqueezeCMM, I was missing a big opportunity – I was just shortening my links with whatever tool I happened to think of in the moment – bit.ly, tinyurl, etc. They did the job, I figured, and what more could I ask for? As it turns out, I could have asked for a LOT more. My client, SqueezeCMM shortens links but they do a lot more. The founder, Jen Evans, is a content marketing pioneer, which means she was using blogs, whitepapers, infographics, slide decks and more to drive her customers’ businesses since before the term “content marketing” was coined. And to measure how well the content was doing the job, she used many different tools, like web analytics, social media analytics, email analytics… But she noticed a gap. The tools all measured how well a certain platform was performing (like a website or Twitter) but the customer’s content was hosted on many platforms and they were using many tools to promote it, so putting together meaningful data was a nightmare. Showing the value of the content and figuring out how to optimize it was impossible. There was no data for that. And many tools focus on when people SEE your content, not when they ACT on it by clicking links and signing up. So Jen’s team invented SqueezeCMM. It’s a really powerful tool for marketers, especially those who promote a lot of links to a lot of platforms, but it’s pretty useful for bloggers and casual tweeters, too. For example, my SqueezeCMM reports show me which content resonates most with my audience on Twitter vs. my blog or Facebook and what’s most popular across all those. (Definitely #womenintech!) And it tells me which channels give me the best engagement (still Twitter, but with the detailed data I can figure out what to post to the others to get more action). SqueezeCMM even tells me what day of the week is best for me to promote to each platform if I want people to click my links – and it’s not the same for my audience as the generic advice you can get online. I can even tell what day is best to promote different blogs based on when people are more likely to click thorough. Here’s a comparison of two blogs I’ve posted to frequently – one gets the most clicks on Mondays, the other on Tuesdays, regardless of when I post. Here’s where it got really cool, though. When I guest blogged for a conference, I squeezed the links within my blog that they uploaded to their own site. I included links to their information page, some YouTube videos, and the conference presenter’s bio. As soon as they posted my blog to their site, SqueezeCMM started reporting to me when people were clicking on those links. I have no access to that website, so even if they have Google Analytics or Omniture, I wouldn’t get those reports, but I could still see that my post was generating user engagement and demonstrate that to the people who asked me to write for them. I also built “paths” on Squeeze so I could see how many people who clicked from their site to my site continued on to click through my calls to action. It’s easy to see how valuable this would be to someone spending a lot of money on generating and promoting content. The marketers we’re supporting use a lot of channels – dozens, even hundreds of Twitter accounts, Facebook pages, Pinterest, Instagram, LinkedIn… Then there are paid ads, sponsored posts, 3rd party directories, even printed brochures. And they can all link to the same content assets on several different sites with links in the asset to other sites and assets. Their needs are much more complex than mine, so what SqueezeCMM does for them is even cooler. Over the past few months, I’ve talked to a lot of users and incorporated their feedback into the new features we’re launching when we move out of beta today. So now it’s time to sit back, applaud the SqueezeCMM team on a job well done, and wait to see if the users love the new features as much as they love the core product. It’s been a wild ride, and there’s nothing quite like a launch. Happy Launch Day, Squeezers! One of the common themes I’ve noticed in discussions about getting more girls to choose tech as a career is that boys more often like to tinker with tech for its own sake, while girls like to solve problems. A female engineer from Stanford has invented a toy that addresses this, along with her own observation that little girls like to read. This is the kind of toy that would have appealed to me even more than the puzzles and block sets that I played with while the other girls were pretending to be princesses or dressing up their Barbies. I enjoyed “boys toys” but wish I’d had stuff like this to play with too. Maybe I’d have come to my tech career through a more direct path if I’d had GoldieBlox. And maybe some of my friends who didn’t end up in tech might have been my colleagues if they’d played with GoldieBlox. P.S. I love, love, love this promo video featuring some little girls letting their inner geek come out to play. This is a cross-post of a blog I wrote for the FITC Toronto 2013 design and technology festival. You can find the festival site here. If there is an award for the speaker who packs the most examples into an hour talk, Daito Manabe is a front runner. Despite the challenge of presenting through a translator (Manabe spoke in Japanese), he kept us engaged with a rapid fire tour of his fascinating creative projects. Manabe could also be the “poster boy” for FITC, embodying the intersection of Future, Innovation, Technology and Creativity. While I didn’t know what it meant going in, I can’t think of a more apt title for his session than “Beyond Interaction”. Daito Manabe describes himself as an artist, designer, programmer, DJ, sound designer, hacker… but those labels really only scratch the surface. His experiments with light, sound, body movement, electricity, and more combine art and tech in very unusual ways. Words can’t do justice to what Manabe showed, but his YouTube channel is a treasure trove of fascinating videos. Early in the talk, we were introduced to his work using sensors responding to the body’s electrical signals and translating those signals into sound and light as his dancers and other subjects moved or clenched muscles. Later he added projection mapping where lights seem to flow from and with the dancers. All of Manabe’s art is infused with passionate geekery, never more evident than when he expressed his delight upon learning that myoelectric sensors have effectively no latency because they respond to the body’s electrical signal prior to the actual movement, so there is time to transmit signal to the lights and sound and synchronize them with the dancer’s movement. Not satisfied with just sensors, Manabe moved on to the reverse– electrical stimulation devices to induce movement. Watching his eyes twitch or his model’s arm raise based on inputs reminded me of the life-changing technology implanted in a member of my extended family, allowing her use of her arms and hands after she was paralyzed from the neck down. But here, similar technology is combined with light, sound and other movements to create fascinating art. In this video his colleague becomes essentially a musical instrument as Manabe “plays” him. Over the course of an hour, Manabe took us on a journey through a fraction what’s possible when you combine technology with an incredibly creative mind. What does a pair of miner’s boots have to do with a design and technology conference? 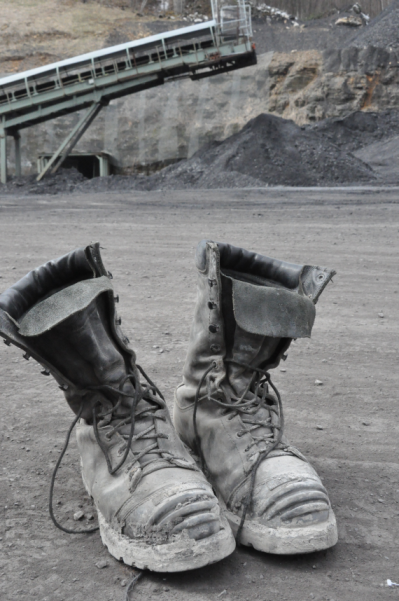 I happened upon these well-worn boots at a coal mine in West Virginia, where I was waiting to test emergency communications gear underground, and they really spoke to me. They form the core of my favorite photo set of all that I’ve taken in my travels. When I first saw these boots I pondered the stories they could tell and what a different life their owner has from mine. Standing there in my own work boots, with my hard hat and safety gear in the truck, I thought about the miner who had walked in the muck so many times in his and I smiled at how lucky I am. My tech career has taken me a lot of places and introduced me to a huge variety of people whose perspective and experience is vastly different from my own. I realized that it’s one of the reasons I’ll never tire of working in tech. Every day, month and year introduces me to more and more fascinating people with fascinating lives. Of course, many of the people I encounter spend their days in much more familiar environments, but their days are still vastly different from one another and from mine. Whether I work with coders and techs, or marketers and analysts, with bankers, public safety workers, entrepreneurs or artists, I’m infused with a new way of thinking every day. Tech is a common element we all share, but we approach it in such very different ways. Just as I’ve learned and been inspired by the miners who venture into danger every day, I’m affected by everyone I encounter and I actively seek opportunities to see the world through a different lens. That’s why I want to attend FITC. Unlike many niche events I attend, FITC deliberately brings together individuals from many different disciplines to co-mingle and play off one another, allowing worlds to collide and creating opportunities for the special brand of inspiration that results when people whose daily routines are very different come together. I hope I’ll be able to attend this year, and hope to see you there too. You can register here. This is a cross-post of a guest blog I wrote for Girl Geeks Toronto. You can find the original here. 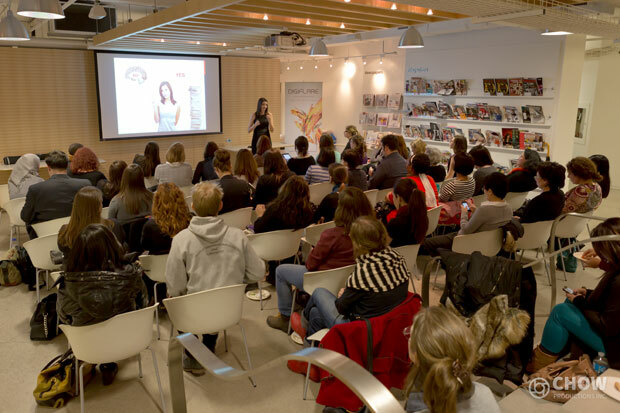 Girl Geeks Toronto runs monthly tech talks in a friendly social environment. Their talks are accessible to both techs and non-techs, and men are welcome. This month’s event brought together two topics that showed how technology is enabling marketers to be more relevant to our audiences. Asif Khan from the Location Based Marketing Association talked about how marketers are using Location Based Marketing (LBM) and Diana Lucaci and Katerina Juskey from True Impact Marketing introduced us to neuromarketing, which measures brain responses to really understand how users are truly responding to marketing messages. Through these two lenses we can begin to see the depth and breadth of marketing tools technology has enabled. One of Asif’s core messages was that “location” doesn’t mean “mobile” and LBM isn’t just about checking in on Foursquare. Asif described it as “the intersection of people, places and media.” Wherever we are, and whatever device or app we choose, that’s a location. Asif showed us a lot of intriguing examples. Some showed marketers offering services where the customer is, such as digital walls in airports where travellers returning home can order the groceries they’ll need to restock their fridges, and pizza ordering stations in transit shelters so riders could order dinner while they wait for the bus and have it arrive soon after they get home. 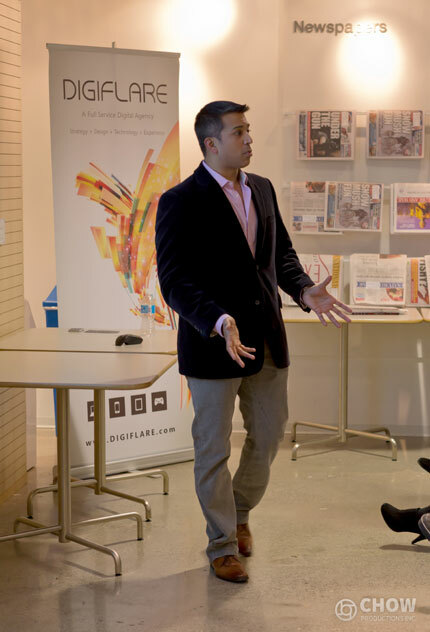 Asif also shared examples of marketers increasing relevance based on real-time LBM data, like digital signage on a NYC bus allowing ads to be selected for each intersection based who has checked in to services like Foursquare instead of a static ad based on the bus route’s demographics. Some examples used onsite-only offers to draw customers to the advertiser’s location. For instance, few users pay for advanced Angry Birds levels, but many choose to shop or eat at advertiser locations (e.g. McDonalds in China) where they can unlock new levels for free. If LBM is about getting the right message to the right people at the right time and place, neuromarketing (NM) is about determining what the right message IS. One of the big ideas behind these tools is that what people say they think and feel doesn’t always match what they really do, so focus groups and surveys can’t always give an accurate insight. Diana also pointed out that what questions we ask, how we ask them, and who else is in the room can affect subjects’ responses in traditional market research but by measuring the brain’s response neuromarketing can cut through some of that and tell us what people are really responding to. Used in conjunction with traditional research, NM can fine tune our understanding of the results. Diana also showed us how we make decisions, with the part of our brains that handles emotions causing us to respond – mentally and even physically – before we even begin to think about a decision, and urged us to keep that in mind when we’re making decisions. Even when we don’t think we’re being affected, we are, and the fMRI can measure that. One of Diana’s intriguing use cases involved three stop-smoking ads being shown to a focus group, which chose ad “B” as the most effective, while fMRI scans showed people really preferred ad “C” and in the real world, ad “C” drove 3 times as many calls as the others. Ads “A” and “B” were both based on rational arguments against smoking, the reasons we all want to believe we make decisions, while ad “C” tugged the heartstrings, addressing how hard it is to quit and how smoking affects our families. The fMRI was able to show that despite what the focus group respondents told marketers (and themselves!) the emotional appeal is the one that really worked. While the fMRI gives the deepest insights, EEG is a very effective tool because it provides immediate readings and it’s more portable and easy to use. Katerina told us about EEG’s and how they can show negative and positive responses and whether the subject is really engaged or tuned out. They also showed us a great example of how eye tracking can help us improve campaigns. Eye tracking on an ad showed most time spent looking at the headline, a little at the model, and almost none at the product. By changing the ad so that the model was looking at the bottle, viewers’ behaviour was changed and they spent more time looking at the product. Eye tracking identified what was happening, cueing marketers to make changes, and then measured the result to show that the change worked. Diana acknowledged that neuromarketing is quite new and there is controversy around its effectiveness, but she likened selling it to selling some of the earliest websites. Many of us can remember when businesses were skeptical about whether a website would really drive business, but now there’s no question about it. Similarly, Diana expects neuromarketing to become more mainstream as marketers gain more experience using it. So we covered a lot of territory in a single session, but it all comes back to one of our core challenges as marketers – how to be as relevant as possible to our audience. Location Based Marketing and neuromarketing are two great examples of how technology gives use new and exciting ways to make our content relevant. Did you attend the Technology and Marketing: From Mind to Map event? What was your biggest takeaway? Product Management: What distinguishes the top 1% of product managers from the top 10%? A really great answer to what makes for a truly outstanding Product Manager, written by Amazon’s Ian McAllister. How do you deal with the sexism? – except when I’m there. 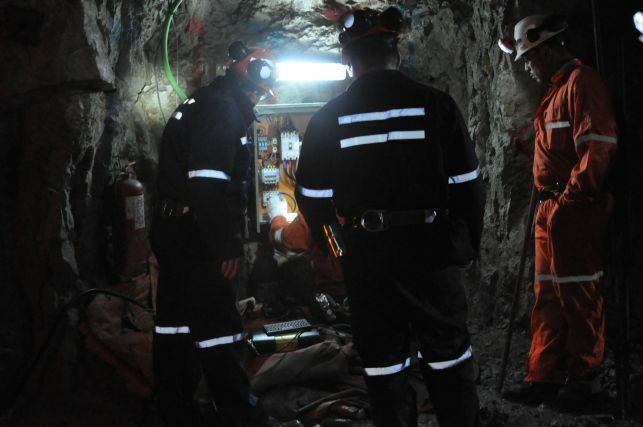 A colleague recently asked me how I deal with sexism in mining. As I thought about my answer, I realized I hadn’t been conscious of sexism in mining but had of course been dealing with it. Mining is far more male-dominated than tech and a moment’s reflection was enough for me to recognize that I’ve observed some sexism there. I just hadn’t paid attention to it because it wasn’t a problem for me, any more than it has been in tech, banking or public safety. Like many other potential obstacles, I’ve worked around it and carried on. But the question caused me to reflect a bit on how I do that. I don’t know if my approach would work for anyone else, and I know that a lot of the circumstances where women experience it don’t apply to me, but I thought I’d share my approach in case it’s useful to others. One of the things I’ve loved about tech from the beginning is that when I know something and can do something, people respect that. They care less about what I can’t do, what I haven’t done, or who I am than what I actually show I can do. When I started out in tech as a second career at 31, I was worried about being 10-15 years older than my peers and much less experienced in tech than the teens who had hacking since childhood. I was hired by an ISP for my Cisco routing and switching knowledge but initially spent some time in tech support learning the business before moving to network operations. The fellow who showed me the ropes was 15 and I got the distinct sense at first that he and his peers were quietly rolling their eyes at the “senior citizen” who’d never managed a Unix system or even written a Perl script. In retrospect they were probably also underestimating me because I was female, but I wasn’t thinking about that. I was thinking about my age and inexperience. Before long, I had a chance to show what I could do. The network was down and the only person with passwords to the core routers was not answering his pager. I mentioned to my boss that if I could get physical access to the equipment, I could bypass the password. Management took me up on my offer and within a few minutes I’d identified the problem, corrected it, and restored service to our customers. Word travelled fast that, “poD_ can hack Cisco routers!” That was a major turning point. In calling me by my IRC nickname, my peers were admitting me into the club. I was recognized as a “real tech”. While I wasn’t really “hacking”, the fact that I could bypass the password on the mysterious Cisco router and fix a big network problem gave me cred. From then on, I traded Cisco expertise for Unix expertise and never worried about my age or background again. People who make business decisions based on gender, or ignore good advice because of who it comes from, tend to display poor judgement generally. I suspect I’ve avoided a lot of sexism by avoiding places that weren’t the right fit for other reasons. Sexism and other “isms” tend not to occur on their own. Back in the 90’s I went for a network ops job interview at a big telco. I’d heard nothing but bad things about them as a workplace, all of it from men since there weren’t yet many tech women to hear from. Their reputation shouted “you’ll hate working here!” but they were a big name for the resume and had a big network I could learn from working with so I interviewed anyway. During that interview, I observed a lot of negatives about their approach and culture. I also experienced the only direct sexism I can recall encountering in my career when one of the interviewers said there are people in the department who don’t think women should work on networks. In the moment I was startled, but afterward I realized that was just one more nail in their coffin. They probably wouldn’t have offered me the job because I’m female, but I didn’t pursue it because the interview showed me it was just as messed up a place as I’d heard, maybe worse. Sexism was just a symptom of a much bigger problem. In 2003, I had a chance to hear Dr. Veena Rawat speak when she won the Canadian Women in Communications (CWC) Woman of the Year Award. In 1972, Dr. Rawat was the first woman to graduate with a PhD in electrical engineering from Queen’s University. She was also an immigrant, having moved to Canada from India only 5 years before. As a female engineer and an immigrant in 1973, Dr. Rawat experienced discrimination far greater than anything I’ve encountered. Words to live by. Even though I push back against sexism in society and industries, I’m rarely able to eliminate sexism and other irrational biases in specific people and situations. So I treat them as constants and get the job done anyway. From a practical standpoint, it rarely matters whether I’m being underestimated because of my gender, because I currently report to marketing instead of engineering, because I’m new to a company, or because someone thinks redheads are temperamental. What matters is that I’m being underestimated. So I deal with that, and work around people who are present barriers to my success. I have friends and colleagues whose approaches are very different from mine, and I would never suggest that my approach is better for everyone. But for what it’s worth, it’s worked well for me. I’m jazzed to be guest blogging this Monday’s Girl Geeks Toronto event! The team has lined up three really interesting speakers to discuss Technology and Marketing: From the Mind to the Map. Imagine you could read your customer’s thoughts on an emotional level or reach them with just the right deal, in just the right location to get them to buy. Technology, and the science behind it, has brought a new level of sophistication to many industries, and marketing is no exception. Join other girl geeks (and boys!) for an evening of exploration around topics in marketing that leverage new technologies to reach and understand consumers on a more personal level than ever before. Diana Lucaci, founder and CEO of True Impact Marketing, will be providing an introduction to Neuromarketing. She will explain why one would use brain measurements for insights, what can be accurately measured, and how to get started. 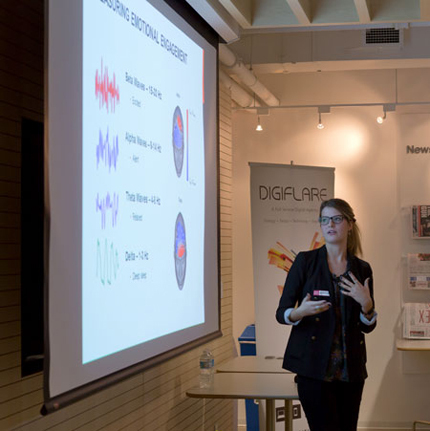 Katerina Juskey, a Neurofeedback Specialist from True Impact Marketing, will be joining Diana to provide insights on the technology behind neuromarketing. Asif Khan, consultant and founder of the Location Based Marketing Association, will provide a perspective on the state of location based marketing – the techniques and technology, and how they are being applied. By the end of the night you’ll have a deeper understanding on how technology is helping companies better understand and attract you as a consumer. I hope to see you there, but if you can’t attend watch for my blog next week. Full disclosure, I’ve had some kind of BlackBerry in my hand pretty much constantly since 1999. Every time I try to embrace another device, I find it slowly relegated to the desk drawer. So I want Blackberry to survive and thrive. And based on what I’ve seen with the BlackBerry 10 (BB10) launch, I think they will. Sure, they’ve built lots of cool functionality into the device, but that’s the price of entry when launching a handset. These two aspects of how they’ve done it are what I think will make the difference. BlackBerry has always been a great communication platform. That’s what has kept millions of us loyal despite other features we’ve missed out on, and it’s made us immune to the teasing about how uncool we are. BlackBerry recognized that this is their core value and built the new platform around it. Key features in BB10 – Hub, Flow, Peek, Share – are centred around making an already great experience even better, and more appealing to non-BB users. Frankly, I had trouble getting excited by early reports of Hub because it sounded like what BB already had. But Hub takes it up a notch, a more elegant way of doing what they already did well with features like pulling recent interactions with a contact together in one place. I already had some of this with “recent activity” in Contacts but BB10 expands it. Very nice. Similarly, while multitasking isn’t new to BlackBerry – I frequently jump between multiple open apps – Flow makes it even easier, smoother. The new stuff will appeal to Apple and Android users but it preserves and enhances what we BlackBerry die hards count on. Another area where Blackberry has always excelled is the corporate enterprise. The new Balance feature plays to that and helps IT managers deal with bring-your-own-device (BYOD) challenges. By separating the platform into “work” and “play”, BB10 lets users add what they want while letting IT managers protect the corporate environment, adding value for their enterprise base while giving users the freedom they want. Brilliant. And of course, the keyboard – BlackBerry listened to us and built a device with the physical keyboard I love, but by all reports they’ve also built one of the best touchscreen keyboards ever. That’s essential for a communication device but also for apps and web surfing in this interactive era. One of the criticisms from Apple and Android users has been the dearth of Blackberry apps. Blackberry recognized the problem and attacked it from all sides to make sure they would not only have a solid base of apps at launch but also a credible promise of many more to come. They supported Alec Saunders’ drive to seed developers with devices, embraced open source, created SDK’s for C++/Qt Cascade, C/C++ Native SDK, HTML5 BB WebWorks, ActionScript Adobe AIR & Java Android Runtime, and blanketed the developer community with resources to support and communicate with those who were willing to work with them. Application Development Consultants (like @garettbeukeboom who spoke before the launch at DevTO to fill us in on what was coming) were all over the developer community making sure developers had what they needed. I heard as much about BB10 in 2012 from developers playing with it as I did from the media. And then there were the portathons. BlackBerry hosted events where developers took advantage of the SDK’s to quickly port Apple and Android apps over to BB10, offering cash and prize incentives. The January portathon delivered 15,000 apps in only 2 days. That not only sets BB10 up with a lot of great apps (approximately 70,000 at launch) but it shows developers just how easy BlackBerry has made it to port apps over. That will encourage more to take the plunge and let the ecosystem grow quickly as customers want more apps. The easy porting of apps is a critical element of making it easy to switch. The best device ever won’t attract customers if they have to give up their favorite apps. But BB10 is launching with a lot of the most popular ones either on board or committed – Skype, Facebook, Twitter, Foursquare, Amazon, Kindle, WhatsApp and Angry Birds, along with business apps like WebEx, SAP, and Citrix. But most apps not yet on board can be ported over quickly and easily to respond to market demand, which means users can be confident that if they switch in large numbers, the apps will follow. BlackBerry removed the technical and economic barriers to app conversion. So here’s hoping users do jump on the BlackBerry train, if only so that I can continue to buy the products I love! 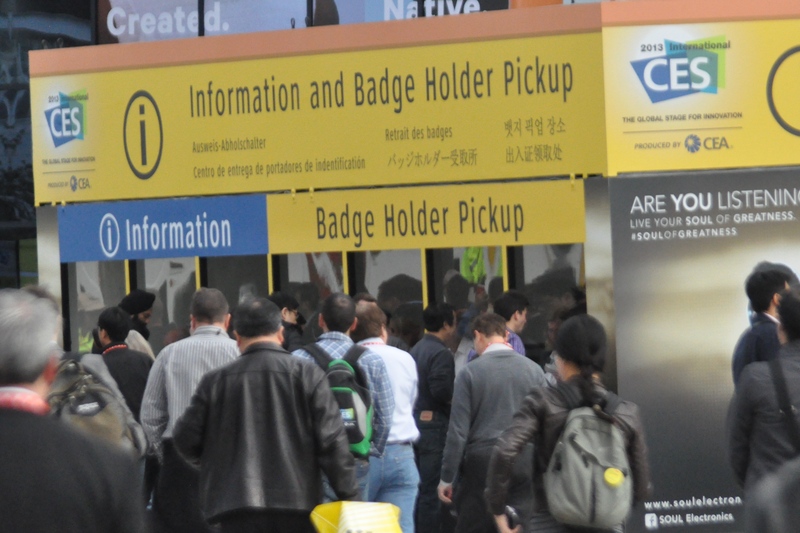 This month, I went to the Consumer Electronics Show (CES) for the first time and it was a real eye opener in many ways. Not the least of these was as a chance to compare my impressions of CES through my social media feeds with what I was seeing first-hand. I’ve always recognized that our feeds are naturally skewed by our choices. I try to include a broad range of sources but my interests and connections can’t help but colour my selections so like any media source, my feeds are limited by what those publishing to it choose to share and what I choose to seek out. Based on my feeds, I was expecting to see much more emphasis on non-Apple phones than what I saw on site. My feeds were rife with news about Samsung, LG, Qualcomm and others, driven by big splashy booths, parties, multimedia campaigns and splashy speakers like President Clinton. But on the show floor, I could not miss the ubiquity of Apple devices. The story on the floor was Apple Everywhere. EVERY building was packed with iPad and iPhone accessories. Sure, there were accessories for other mobile devices, but you couldn’t swing a dead battery without hitting an Apple accessory. If you’ve ever thought, “Someone should make X for the iPhone,” someone probably has and was showing off their X at CES. You couldn’t miss the implication that while the other guys have cool new stuff, consumers LOVE iPhones and iPads so the apps, cases, batteries, keyboards, projectors, speakers, you name it. My social media feeds kept talking about how Apple was not at CES, but really they didn’t need to be. Their partners were everywhere. In fact, the Salesforce.com Marketing Cloud analysis told the story that I wasn’t hearing from just reading my feeds. That’s right. 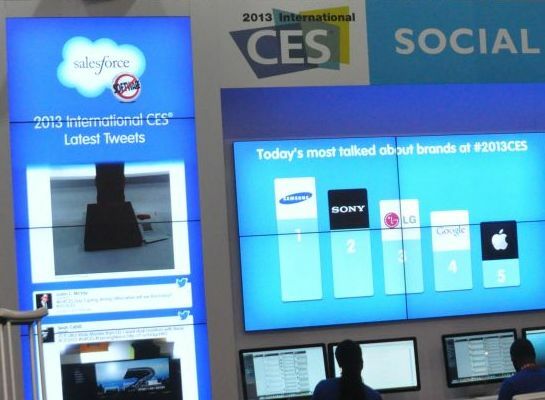 Even though they weren’t there, Apple was the 5th most talked about brand in Social Media related to CES. I readily admit to be a number crunching geek, so the opportunity to see some of the stories behind the chatter based on Market Cloud’s numbers drew me in. I’d seen my own feeds and I’d observed the floor, but by scanning for #2013CES and many popular brands, the the tool cut through my perceptions and let the numbers speak for themselves. People were talking about Apple more than they talked about dozens of big name brands that were spending many tens of thousands of dollars on their CES presence. It was a great reminder that while my social feeds are a great way to keep my finger on the pulse, it’s important to seek out other sources, checking perceptions against hard data, sometimes you can’t beat “being there”. What does it mean to be “technical”? And sure, it’s accurate. I’ve designed and built complex networks, developed tech products and services, spent much of the past couple years testing crazy underground wireless gear. I’ve never shied away from getting into the nitty gritty, even when managing or selling things I don’t do hands-on, like software development. And it’s certainly technical when I explain tech products to customers and answer their questions about features or integration challenges, or guide a team of developers to make the best choices for the product we’re building. Which pic shows me doing technical work? But what’s interesting is that I’m often called “very technical” in situations where I’m not doing anything particularly technical. I hear it when I’m just using technology. Many say that today’s young people are “very technical” based on the fact that they use smartphones and computers, Twitter and Facebook,and video games but if that’s technical then I’m an auto mechanic because I drive my car. There’s really nothing technical about tweeting. But it’s tech-enabled, and to those who aren’t comfortable with tech, it probably seems like it must be technical. A lot of people who say, “I can’t do X because I’m not technical” really COULD do X if they weren’t scared. So maybe there’s an element of just not being scared to work with things that are technical. Even in the realm of deeply technical work, it’s interesting what different communities view as “technical”. In some circles, only those with an Engineering Ph.D who are creating brand new tech in the lab are real techs. In others, you’e only tech if you can write code and create an app or a website. With others, “tech” means you can make stuff work when things go wrong. 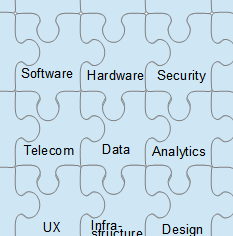 Techs can be expert in hardware, software, radio signals, network, storage, security, databases, you name it. And the thing is, many of those who are the very best at their particular brand of tech are completely unfamiliar with the others. Ask an amazing middleware architect to get a wireless signal working and it’s hit and miss whether they will even know where to start. It’s not just different types of technology, though, it’s also different phases. I’ve seen some brilliant R&D engineers who solved problems nobody else in the world could solve but struggled trying to build a product around their invention. I’ve seen coding whizzes rattle off working applications in mere hours then flounder helplessly when their laptop couldn’t connect to wifi. We all have different skills and expertise, and that’s part of what makes the world of tech so exciting. It’s also what makes tech hiring so difficult. How many times have you seen someone with dazzling technical skills fail miserably in a role that requires a different type of technical skill? The bottom line is that “technical” means many things, and the better we each become at communicating what exactly we’re good at technically, the more successful we, our employers and our clients will be. So, if you’re “technical”, what kind of “technical” are you? And whether you’re technical or not, what kind of technical people do you have trouble finding when you need them? What does “technical” mean to you? When I first read it back in the spring, I was transported back to the day more than a decade ago when those girls came to the office where Karen worked in sales and I worked in Network Operations. Along with other female colleagues, we talked to them about being a woman in tech. We had high hopes that seeing our passion and hearing how much we loved what we were doing would excite the girls and be a turning point for many of them to choose tech careers. We gave it our all. I even threw in a data point that I thought might be more persuasive than our career talk – I confided that some of us had discovered that quite a few men find technical women very attractive. (It’s true! I swear my hotness rating went up a few points the day I first taught the boys in tech support how to troubleshoot a Cisco router.) But whether on sizzle or steak, we hoped we’d piqued the girls’ interest and would find ourselves working with them some day. Well, according to Karen, we touched at least one. She took a summer job in our Engineering department. But what about the other 29? We don’t know what happened to them, but even if they’re an exception from the statistical norms, it’s unlikely that many of them pursued tech careers, which is too bad. Karen’t post touches on some of the challenges of getting more women into tech but true to form, she also highlights some of the good news. With so many grassroots groups working to encourage girls into tech careers and provide support networks for those of us who chose tech, I think the future looks very bright and with MaRS CEO Ilse Treurnicht named one of Canada’s most powerful women, things are looking bright. I’m hoping that by the end of 2013 we’ll see another column from Karen with even more good news from her perspective working with entrepreneurs at MaRS. What do you think? Should we keep working to get more women into tech? What does Google Maps on iPhone mean for Blackberry? This Wired article, talking about why Google would help make iPhone even better, by putting Google maps on iPhones, got me thinking. He is absolutely right, of course. Google’s core business is advertising and Android is mainly a means to an end for them. By enabling iPhone (and my beloved Blackberry) Google is keeping its eye on the big picture. But what if Google had a bigger need to drive Android handset sales? Would they withhold Google apps from iPhone then, trying to drive users to Android? My bet is no. Because it would be a losing game. You win in handsets by delivering the best all around handset, not by making minor dents in how good someone else’s is. Someone in my Twitter feed called iPhone “the best phone on the planet“. Many would agree with him. That’s why iPhone is so popular. Google is smart enough to know that one map application wouldn’t change their minds. If Google wants to win in handsets, it will win by making handsets that more people consider “the best“. Which leads me to RIM. RIM’s strategy seems to be to compete in handsets. With BB10 they are trying to win back customers who have defected to iPhone and Android, hold onto those of us who still prefer Blackberry, and maybe even convert those who have never used Blackberry. Will they win? How much of each group is reasonable to think they will win? Much as I adore my Blackberry and all its predecessors back to my first little pager in 1999, I know I’m not the mass market. I don’t like touch screens. I type a lot – to search, write, communicate, make notes, you name it. My thumbs are always on the keyboard tapping away. I view/listen/watch much less than most people so I value the keyboard more than screen size. I’m not a game player so I don’t worry whether they’re available for my device. But RIM can’t survive on oddballs like me alone. But what if RIM were to rethink what their core business is? What if the answer turned out to be secure communication software, and mobile keyboard technology? Imagine a market where iPhone or Android devices were available with Blackberry software and keyboards. What would that look like? Would Apple use them? They’re embracing Google maps, so you never know. This is a cross-post of a piece I wrote for the CanWIT e-Mentoring program’s blog. I mentor three women through the program, and the program’s Community Manager, Colleen Fraser, asked me to write about what I get out of being a mentor. Here is my response. Long before I realized that I was a geek who loves technology, I was a French Horn player. Throughout high school and my music degree, I studied with a teacher who influenced me in more ways than just my ability to produce beautiful music from a coiled brass cone. My horn teacher was a major influence on me, and to this day his words often come to mind in my business life. Only now, those words have even more meaning because as a mentor I find myself giving advice that I need to remind myself of as well. Mentoring others benefits me in many ways, but as I reflect on some recent experiences I’m struck by how much mentoring others is a reminder to “do what I know”. Case in point. One of the women I mentor through CanWIT’s e-mentoring program was struggling with how to package herself to get noticed and valued by potential employers. She was dealing with a dilemma I often have as well. Her skills are both broad and deep, and there are many roles she could love and excel in. If she describes herself too generally, though, she won’t resonate with employers seeking a particular subset of her skills. But if she targets too narrowly, she won’t be noticed by those wanting skills she hasn’t highlighted. So what to do? It’s an issue I’ve wrestled with as well. I excel as a product development leader, but also in business development and marketing. I’ve achieved great things leading teams in large bureaucracies, but also as a maverick individual contributor aligning others only through influence. Which Sandi should I promote? It’s easy when there is a known, posted opening because we can tailor to the position. But most jobs aren’t posted so what about more general communications? When networking, people say, “What do you do? What role are you looking for?” Telling them, “It depends” doesn’t get us very far. As I talked with my mentee, I found myself relaying a marketing class experience where the goal was to select a target segment and position the product for them. Most in my workgroup struggled with concern that we would miss most of the mass market by choosing a target segment, but it was clear to me that we would miss ALL of the mass market if we didn’t target anyone. By explaining what our product could do for one segment, we inspired the others. Now they could see the product’s value and come up with their own use case for it. I’d seen that many times over, presenting potential uses for technical products to businesses and watching the magic as the customers began to chat amongst themselves about how it could work in their business. I felt cocky because my classmates were learning something I’d known for ages. I didn’t feel so cocky when telling the story to my mentee, though. I couldn’t, because the story was reinforcing what I’d been doing wrong in looking for a job or projects for my company. I wasn’t giving my target markets much of a clue what I could do for them. I was hoping they’d see a list of “Sandi product features” and figure out how they could use me. Why? Because I was afraid that by defining my value to any of them, I’d miss out on the rest. By teaching what I know to someone else, I reminded myself what I know about product marketing and realized I wasn’t doing that for “product Sandi”. I think this is one of the most valuable things about mentoring, and another recent experience reinforced it as well. I had the opportunity to get advice from a very senior executive – a successful CEO and board member who was generous enough to give me some of her time. After she’d given me a bunch of really valuable insights, she asked for my feedback on HER resume. Yikes! I was nervous. What do I know about a CEO/Board Member resume, I thought? How could I possibly add value? But it was the least I could do in return so I said I’d be happy to. She sent me her resume, and as I stared at it (marvelling at how effectively she had summarized decades of experience on only 2 pages), something stood out to me as missing, one of the basics of resume writing. I wasn’t sure it would apply to a CEO, and I was nervous that she might see my feedback as evidence that I’m not at her level, but I bit the bullet and sent her a note telling her what seemed to be missing, Her response? It’s not that she didn’t know what to do. She hadn’t done what she knows. Just like I sometimes don’t. Like we all sometimes don’t. And so it goes. Even the best of us don’t always do what we know. Mentoring young colleagues, and even advising someone senior to me, gives me a chance to look at myself through a different lens and to hear myself offering the advice to others that I myself need most. Mentoring reminds me to “do what I know”. I’m grateful to those who accept my mentorship for those reminders. I can only hope that they get as much from our interactions as I do. This article from the May 2012 Harvard Business Review looks at 6 myths of product development and they are right on the money. “Fallacy 3: Our development plan is great; we just need to stick to it. “Fallacy 5: The more features we put into a product, the more customers will like it. These two myths are responsible for a lot of the PD I’ve seen go wrong. To combat Fallacy #3, we have to recognize that we can never know everything we need to from the start, and keep reviewing what we know at every stage. A lot of people tout the Agile development method as the fix for this, and it can help but Agile alone won’t do it. Without strong leadership from the Product Development team and continuous review of customer and market requirements, technical expert feedback, and the competitive landscape, Agile alone will just get you to an ineffective product quicker. With that said, it is also critical that PD not change requirements without very good reason, as the changes usually add time and cost (and drive the tech team crazy!) It’s a balancing act. Fallacy #5 is a very popular belief but it doesn’t take much examination of the products we enjoy using to realize that too much complexity for the customer can prevent adoption and too much complexity “under the hood” can add costs and potential for things to break. Here again, a balance is essential. Consider designing for features but not implementing until/unless the market really wants them – advance planning so they can be added later without going back to the drawing board. And consider your target user. If most of your market wants simplicity, make sure they get it. Hide advanced options if you want to make them available for power users, but keep in mind – we don’t always care about every feature we think we might want. Research, market test and evaluate carefully before committing to too many features. Elegant simplicity can be a big winner. 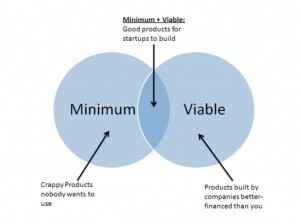 Check out the Harvard article for more advice on these and other product development myths. Founded in 1999, ClearFit originally catered to large multinationals, selling sophisticated applicant-screening software to their HR departments. After a few years, the partners decided to adapt their system to small businesses. But the resulting product, loaded with features, made explaining it to prospective clients feel like “a slow ache,” Baldwin recounts. A recent report from Startup Genome showed Toronto tied for 10th place on their list of the world’s top ecosystems for startups. Mark Zimmerman, an advisor in the MaRS information technology, communications and entertainment practice, delves into Toronto’s scorecard to look at the good, the average, and the bad. You can read Mark’s post here. The report rings true to me, and Mark’s commentary helps explain why. Toronto is young, as startup cities go, and because the report split Toronto and Waterloo (while considering San Francisco and Palo Alto a single ecosystem) I think some of the strength of our close ties to the Waterloo community might be lost, but we are definitely playing in the big leagues and if we continue as we have been evolving, Toronto will move up higher on the list over time. Lie spotting expert Pamela Meyer gave a great Ted Talk on “How to spot a liar” where she opens by mentioning that lies are a cooperative act. The lie gets power when someone agrees to believe it. She mentions this only briefly before focusing on how to spot lies but it was enough to get me thinking. Sure, we knowingly agree to go with the lies sometimes. “You’re the best kisser I’ve ever known!” But what about when we don’t recognize that we’re being lied to? Maybe the liar is just that good. But how often is that? How often, instead, does something subtle tell us we’re being lied to but we choose to ignore it? We don’t want to believe we’re being lied to. The lie is telling us what we wanted to hear. Or maybe we just don’t want to deal with the implications the person lying. Meyer’s brief comment at the beginning of her talk is food for thought. When we go along with lies, we’re not really being honest with ourselves. At least, that’s what I’m telling myself. Illegal file sharing increases content revenue? Conventional wisdom tells us that illegal file sharing reduces revenue to the content producers (films, music, etc.). This study suggests that might not be the case. It suggests that illegal file sharers promote the content they like, causing more people to actually pay for it. What tech are you underestimating? What’s up with women in tech? As I was pondering where to start this new blog, I attended an interesting discussion that revealed Unconventional Wisdom coming from a group of young women in tech. 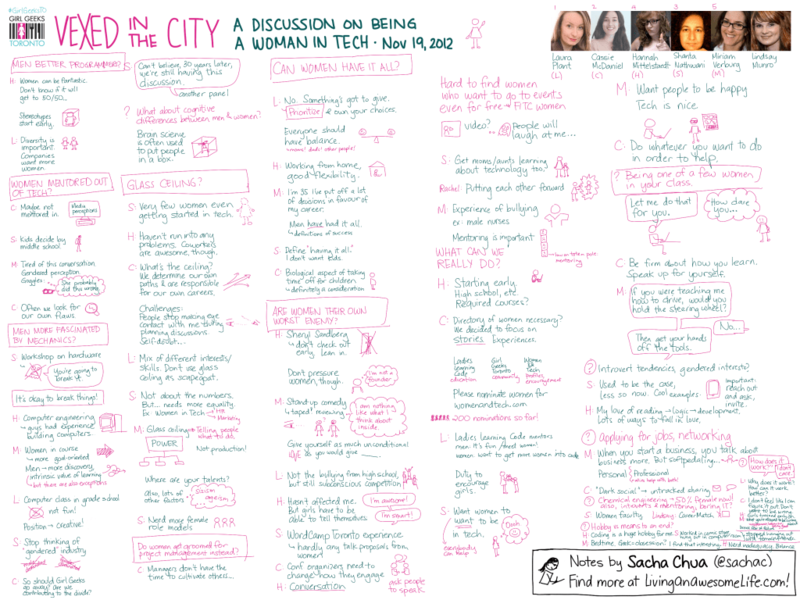 I hadn’t attended Girl Geeks Toronto for a while, but decided to check out their panel on being a woman in tech and while it started out sounding like the same discussions we’d had when I was their age, I was intrigued by where it went. The fact that the event took place underlines what hasn’t changed – women are still a small minority in technical roles. When I first jumped into tech, as a router jockey in the 90’s Internet explosion, I was “the girl” on every team I joined. Customers didn’t need to ask my name because if they called back they could just say it was “the girl” who deployed their network or fixed their problem. That didn’t change much as I progressed through operations and engineering roles or even technical management. Until I made the leap over to marketing, I was “the girl”. Back then, I thought for sure the picture would be different by now, but both the stats and the other night’s anecdotes told a different story. Women in tech might now be a few among many, instead of the only one, but it’s still largely a man’s game. Then as now, conventional wisdom said this is the result of things like sexism in hiring, lack of encouraging girls to study tech, and negative pressure from male peers. But that’s not what I heard from the Girl Geeks the other night. Whether these views are right or wrong, they all have something in common. They show the panel and audience focusing on why girls and women CHOOSE not to pursue tech jobs, instead of who might be preventing them. So much for the conventional wisdom of external roadblocks keeping the numbers of women in tech small. So what can we do about it? What should we do? Is it even a problem? Those are questions we couldn’t tackle when the focus was on external barriers. By looking past those assumptions to discover that girls and women are keeping their own numbers low, we can start to address these new questions. I’m not saying that initiatives to hire more women and make sure girls aren’t discouraged from studying tech haven’t been worthwhile or should be stopped. They just aren’t the whole answer. Does your brain hurt? Good!